A statue of Cristiano Ronaldo that was widely mocked and left football fans scratching their heads has been replaced. The bronze bust of the Real Madrid and Portugal forward went viral with people questioning its resemblance to the player, after it was placed on display at Madeira airport last year. Some compared its likeness to former Republic of Ireland captain Niall Quinn, but sculptor Emanuel Santos said his work was just "a matter of taste". 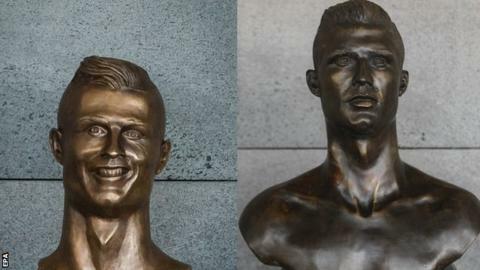 The airport has replaced his original effort with a bust that boasts a greater likeness to Ronaldo. According to Madeira Island News, Ronaldo's family made the request for the replacement through the CR7 Museum, which is based on the Portuguese island. The switch took place on the same day that Ronaldo, 33, scored a hat-trick against Spain in Portugal's World Cup opener in Russia. But the change has not gone down well with everyone and a petition has been started to bring the old sculpture back. "The bust is more an attraction for our island today and we can not accept in any way its replacement," the petition says. The original statue was revealed in March last year at a ceremony to name Madeira's airport after Ronaldo, who is a local hero on the island for what is seen as his rags-to-riches success. Santos later had a second attempt to silence his critics with a second sculpture of Ronaldo, commissioned by the website Bleacher Report.